As with all of the techniques you learn in our lessons, developing your fingerpicking skills is reliant on just one factor, practice. This is especially true for fingerpicking, as you have to get your individual fingers used to the movement and improve their cordination so they only touch the strings you want to pluck at. Watch this lesson many times, practice your technique, and you'll see that you'll be advancing at a rapid pace. Sorry, but you've reached a premium content area. 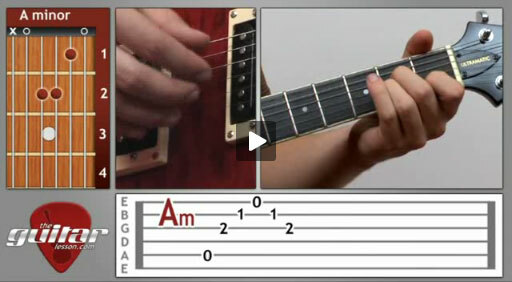 The download of the Fingerpicking – beginner guitar lesson #6 tablature file is only available to premium members. Sorry, the same goes for the backing track. To download the backing track to Fingerpicking – beginner guitar lesson #6, please log in and revisit this page. Good morning. I have just started on the fingerpicking style. Your pdf file doesn’t seem to be working. It won’t let me save it and when I click it, I see a small picture of it. Thanks for the 2 weeks trial.